Our Bora Bora hotel offers many fantastic places to sit, relax and enjoy the scenery around you. We have two restaurants at your service at the Maitai Polynesia Bora Bora and we would be happy to prepare a delicious cocktail or recommend a wine to accompany your meal. Discover an eclectic mix of French cuisine and Polynesian flavors among the dishes prepared by our staff, whose professionalism and kindness will please you. Haere Mai means "Come here" in Tahitian, and you will find the atmosphere of the restaurant to be very welcoming and romantic. One evening per week, depending on the season, a magnificent Polynesian night will be offered at the Haere Mai Restaurant. The evening’s presentation includes a delicious Polynesian barbecue and a buffet of local produce and other traditional Polynesian attractions. This is an evening not to be missed! A children's menu is also available. The restaurant is open daily from 6:45pm to 9:00pm (last order). The Haere Mai Restaurant may be closed at certain times of the year thank you to check for further information, if necessary. 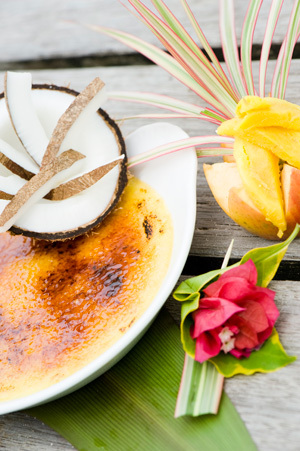 Click here to view the menu for Haere Mai Restaurant at Maitai Hotel Bora Bora. The Tama'a Maitai is located near the beach at Maitai Polynesia Bora Bora, by the edge of the lagoon. Tama'a Maitai means “Bon appétit", and is open every day from 11:30am until 9:00pm (last order). The restaurant has a Fare Potee (a Polynesian chief's house or meeting place) style and was built in the Polynesian tradition of using local materials such as aito wood (ironwood), with a woven pandanus roof and an open kitchen. The atmosphere is casual and relaxed, and the menu offers light meals, salads, pizzas, delicious hamburgers, freshly caught fish and other specialties for dinner. Click here to see the menu for the Tama'a Maitai restaurant. The Manuia Bar welcomes you to our warm and authentic bar, with tasteful décor and a casual and relaxed atmosphere. Come, sit back, and listen to music while sipping on a drink at the bar nestled in the heart of a tropical garden. The Manuia Bar is a perfect place to unwind and relax or chat with other guests around an exotic cocktail, a refreshing local beer or a great glass of wine. The Manuia Bar is open from 5:30pm to 10:30pm. Click here to see the menu of the Manuia Bar. 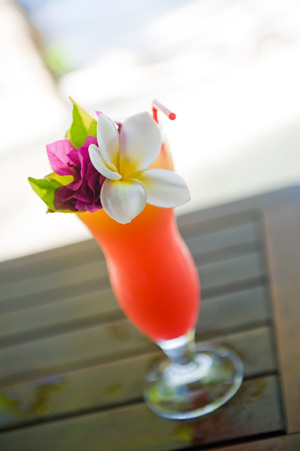 The Beach Bar is also available at the Tama'a Maitai Restaurant during the hours of 9:30am to 5:30pm.